Originally from the Republic of Moldova, Igor Iachimciuc is currently a PhD candidate in music composition at the University of Utah. The first introduction to music began at the age of ten, when Igor went to study cimbalom, an Eastern European instrument, at the music school in his native city. He moved after to the Chisinau, the capitol of Moldova, to pursue his career as a performer. During his student years at the music college Stefan Neaga, and eventually University of Arts, Igor collaborated with the top orchestras and ensembles in Moldova performing music in different genres, touring in Romania, Russia, Hungary, Finland, Israel, Germany, Austria, Switzerland, Belgium, Spain, USA, and Serbia. Igor is a winner of many prestigious instrumental competitions. Among them are Stefan Neaga regional competition, and Barbu Lautaru National competition. While at the University of Utah, Igor performed with various American ensembles and orchestras on the most prestigious stages including Lincoln Center (New York) and Yerba Buena (San Francisco). Igor’s recent engagements include Boston Symphony at Tanglewood music festival, and Intermezzo chamber music festival. 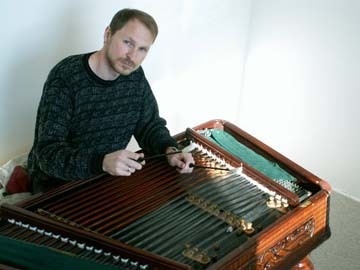 The Cimbalom, a Hungarian string-percussion instrument, was originally used only by folk musicians, but today the stylistic range suitable for this instrument is rapidly expanding. Igor’s recent album Country Road, which can be purchased on iTunes, is a jazz project, recorded with Jim Stout, one of Utah’s best bass players. Besides being a performer, Igor Iachimciuc is a prominent composer. His music has been successfully performed throughout the world.